Below is an amazing lecture from Steve Blank on the history of Silicon Valley. As military funding was a big part of it, the majority of the talk is around the role of electronic warfare in World War II and the Cold War. Steve’s Secret History site shares the full slide deck and more. World War II was the first electronic war – the German air defence even had radar-guided flak guns! Allied bomber formations would throw out a cloud of aluminium foil “chaff” to reflect German radar, which was cut to exactly half the wavelength of the signal. The US military “primed the pump” as the first customer for tech entrepreneurship in the Valley. But in the mid-1970s, the US Government slashed capital gains tax and told pension funds they could invest up to 10% of their assets in VC firms. This entry was posted in Uncategorized and tagged Cold War, electronics, government, hardware, innovation, presentation, security, Silicon Valley, Steve Blank, tech, war, World War II on 19/10/2018 by davidjohnkaye. Geocoding systems are essentially software address systems that assign labels to geographic locations in order to improve navigation and the processing of locational data. Apparently, around 50% of the world’s population doesn’t have a formal physical address, which is a barrier to the access of banking, mail, and emergency services. This is clearly, therefore, an extremely important problem to be solved. There are lots of different types of these systems, but two notable examples are Google Plus Codes and what3words. Google Plus Codes, also known as Open Location Code (OLC), was designed by Google’s Zurich Engineering office. The system assigns each location a short code that is used alongside the name of the settlement or prefixes it with another short string of characters. For example, Nelson’s Column on Trafalgar Square is either GV5C+4R Central London, UK or 9C3XGV5C+4R). 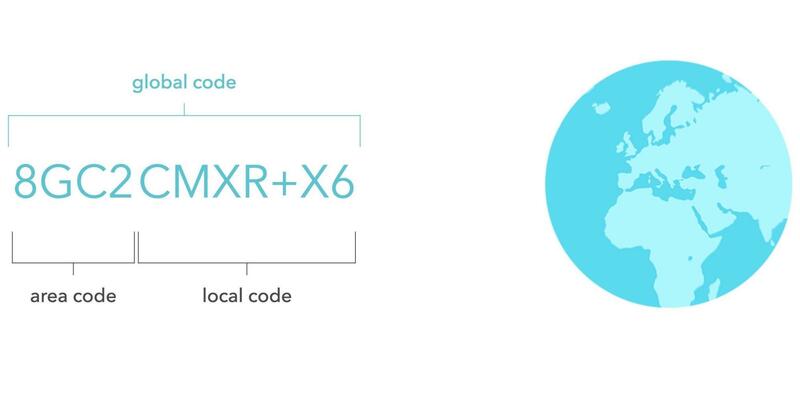 There is a great post by the creators of Plus Codes that evaluates the different “location encoding systems” and explains the rationale behind Plus Codes here. The main benefit of OLC is that it is a free, open source system. 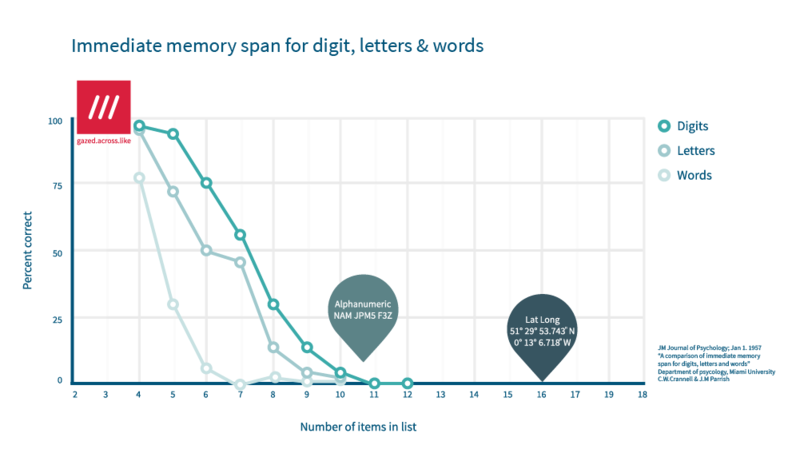 However, a big negative for me is that it is extremely hard to memorise that many characters (see graph below to illustrate the point). I also find it confusing that there is both a long version and a short version of each address point. what3words (w3w) is a system developed by a London-based startup of the same name that divides the world into 3×3 meter squares and assigns each one a unique 3-word identifier. In this system, Nelson’s Column is life.swung.pounds. To use what3words requires paying to get access, so I do wonder whether this will limit the adoption rate compared to Plus Codes which has been opened up to the developer community. However, the beauty of w3w is that the use of only three words makes it super-user friendly and memorable (see graph below). There are some minor challenges: for example, two locations next to each other will have totally different codes, so you can’t look at two codes and understand if they are close or not. However, they are vastly outweighed by the user-friendly nature of having only 3 words to remember. I think that the what3word system is a phenomenal tool and usage will grow exponentially over the next 10 years due to its simplicity. I personally think that Google Plus codes, although a great invention and one with potential uses, will struggle to get adopted by everyday users in the same way. One thing that intrigues me though. Could what3words make more money by making the entire address system available for free to everyone and then charging for services around it? It would be fascinating to play with the financial model there! 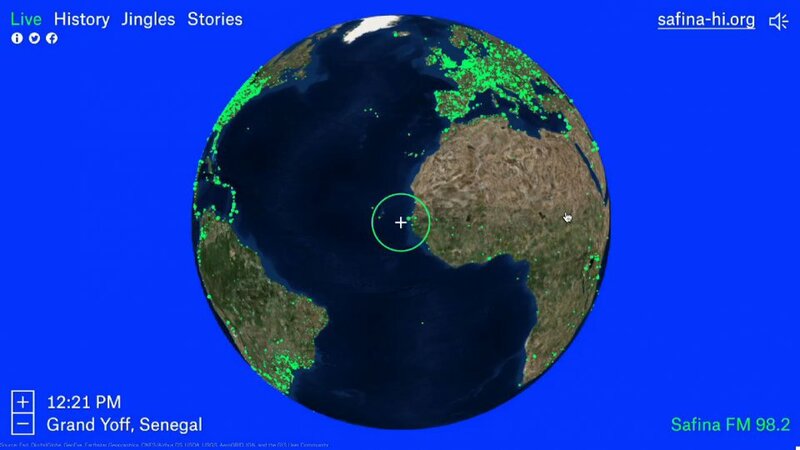 This entry was posted in Uncategorized and tagged Cartography, geocoding, Google, innovation, map, navigation, Plus codes, tech, what3words on 17/10/2018 by davidjohnkaye. I’m a big fan of maps and I’m currently enjoying a spell of learning about Roman history (The History of Rome podcast by Mike Duncan is a particular treat). You can imagine my excitement when I saw these maps of road networks in the Roman world made in the style of the London Underground or “Tube” map. Great fun for the map nerds among us! This entry was posted in Uncategorized and tagged Cartography, Design, Europe, history, Italy, map, Roman empire, Romans, UK on 16/10/2018 by davidjohnkaye. 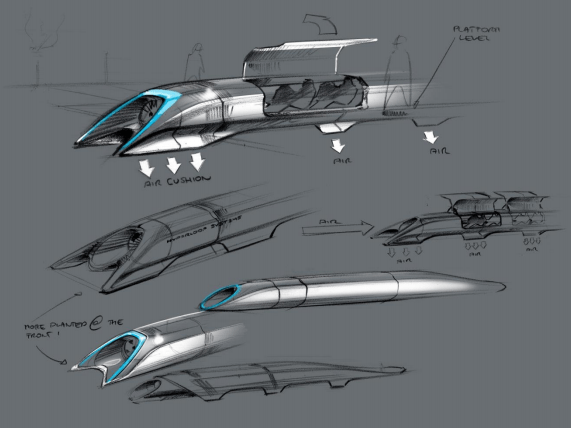 In 2012, Elon Musk and SpaceX published this project concept document for Hyperloop Alpha, a radical new method of intercity transportation. The document is a 58-page proposed solution with rigorous calculations on all socio-techno-commercial aspects of the idea. Hyperloop Alpha is a public transport system that sends people in pods at high speeds through a tube kept at low pressure to reduce air resistance. By using an electric fan at the front, you can mitigate the Kantrowitz Limit (think of the maximum speed limit of a liquid pushing through a tube such as a syringe). It also has the unique benefit of creating a low-pressure air cushion for the pod to ride on – known as an air bearing. The design envisages using linear accelerators on the bottom of each pod to achieve a target speed of 760mph (1,2220 kph or Mach 0.99 at 20°C), albeit lower at points where there is a curve in the journey so that the g-forces experienced by passengers are lower. On the topic of renewable energy, Elon mentions that the installation could be self-powered using solar panels installed on top of the tube. He also mentions that LightSail could provide energy storage, but this shows the age of the document as in late 2017 they all but went bankrupt. Perhaps Elon could consider Highview Power’s Liquid Air Energy Storage technology now! SpaceX hosted a 1-mile long test track to help incubate Hyperloop technologies around the world. Now there are several organisations developing Hyperloop solutions, including Virgin’s Hyperloop One and a team from MIT. The Hyperloop Alpha project concept was actually one of the main inspirations for me to create and write this blog, along with a previous thought of mine about Leonardo Da Vinci. By publishing open source project concepts like this one, Elon found a neat solution to one thing that has always bothered me about Da Vinci’s notebooks. The ever-creative Da Vinci noted down his abundance of ideas in personal sketchbooks that were way ahead of his time. However, as he didn’t always have the time or resources to follow them up and connect them with the right people that needed them, many of them represent lost opportunities for technology to advance. Publishing an idea in an open source format, allowing access for others that are better placed to work on it, ensures that technology moves forward in a way that benefits humanity (even though the ideator as an individual may not benefit directly). I am not assuming that anything I put on this modest site will be anywhere near the same league as those guys, but given that good ideas can come from anywhere it is a possibility that something I put up in my Ideas section may be useful to somebody, somewhere. The Hyperloop Alpha concept document is more detailed than any of mine, but Elon Musk does have a big team of world-class engineers to draw from as needed! This entry was posted in Uncategorized and tagged business idea, electricity, Elon Musk, hyperloop, innovation, product design, public transport, startups, tech, transport on 18/06/2018 by davidjohnkaye.